Our 7th & 8th grade classes (often referred to as Middle School, or MS) are wrapping up their last two years at Ravenswood. Middle schoolers enjoy the benefits of their years of experience with our school. Students are free to choose essentials electives that are most interesting to them. They also rotate to different classrooms throughout the day and benefit from teachers focused on language arts, math, science, and social studies. Our middle school students also spend more time with our counselor and support teams, as they begin to plan for their next steps after Ravenswood. You’ll find information on our middle school below. We’ll be adding more soon. Please scroll down, or click on a link, to learn more. Our middle school teachers are subject-focused. Each teacher teaches a specific subject, along with leading a homeroom. Please feel free to email your student’s teacher directly to discuss any questions or concerns. … including food sources! We dissect owl pellets as part of our lab-based learning. Most work is turned through Google Classroom (GC), which helps our students stay organized, learn how to use computers and technology, and communicate better. Our students use chromebooks, supplied by the school, to access Google Classroom. We ask that all students check GC often, at least once per day. Students can get alerts by downloading the app to their phone or device. Help resources, notes, videos, assignments are available on GC, and it can also be used to post private comments to individual teachers about specific assignments. We focus heavily on applied science and critical thinking in middle school! Middle school students start off in 7th grade by studying Life Science. In 8th grade students will focus on Physical Science. Students will use their gained scientific knowledge to explain some amazing phenomena in the world around us. We will explore different scientific concepts through experiments, designing engineering solutions, rich classroom discussions, and readings. By learning and using science in this way, students will be able to use logic to solve problems in not only science, but across multiple fields. Our 7th graders explore complex mathematical concepts. Each is taught in a unit of 3-5 weeks. In 7th grade, we’ll learn about rates, ratios and proportional relationships, number systems, operations with rational numbers, expressions and equations, inequalities, geometry, and statistics and probabilities. We’ll also do a cumulative push for 8th grade to ensure students are confidently able to tackle more advanced work. 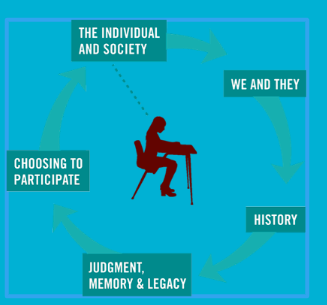 We work closely with our partners at Facing History to create an integrated literacy and social studies curriculum. Our students learn that people make choices - and the choices they make create history. Our students are encouraged to understand those choices in a historical context, and help them learn about the impact of hatred and bigotry, so that they can stop them from happening in the future. We also continue our focus on vocabulary and grammar. Our vocabulary work is based on the Sadlier Vocabulary Workshop. We move through Level B in 7th grade and Level C in 8th grade. Tests are held every other Friday, and assignments focus on word retention. Our grammar work is focused on sentence structure (independent and dependent clauses), punctuation, parts of speech, and active and passive voice. Our doors are always open to middle school students! LIke all of our classrooms, the setup is collaborative. Students work together at tables, sit on beanbags, and recline in easy chairs. 12:15 - 12:45pm - Homeroom Advisory or Homeroom MTSS - students spend time in their homeroom classroom, where they get support on a specific subject. Advisory sessions, where students connect with teachers, get advice, or get support on a specific topic, are held once a week. We appreciate your financial support of our classroom!